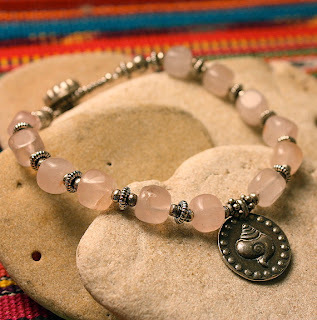 If you have been viewing our daily product updates in the Mind Body Spirit Marketplace, you may have noticed the different Tibetan and Buddhist symbols that are used in some of the artwork, jewelry and textiles that we showcase. These symbols are quite often one of the Eight Auspicious Symbols, known as Tashi Tangye, which are significant to Buddhist culture. In Sanskrit it is known as Astamangala, and these symbols can often times be found in Tibetan and Himalayan people's homes in the form of wood carvings, painted on to the walls, block printed in prayer flags, and embroidered on textiles. 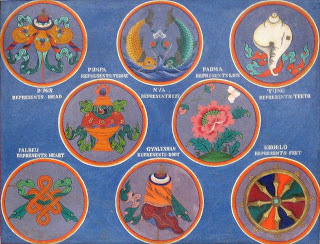 In Buddhist tradition these eight symbols are symbols of good fortune, presented by the great Vedic gods to Shakyamuni Buddha upon his attainment of enlightenment. The Wheel: Khorlo (Skt. Chakra) - Wheel of law or wheel of dharma. 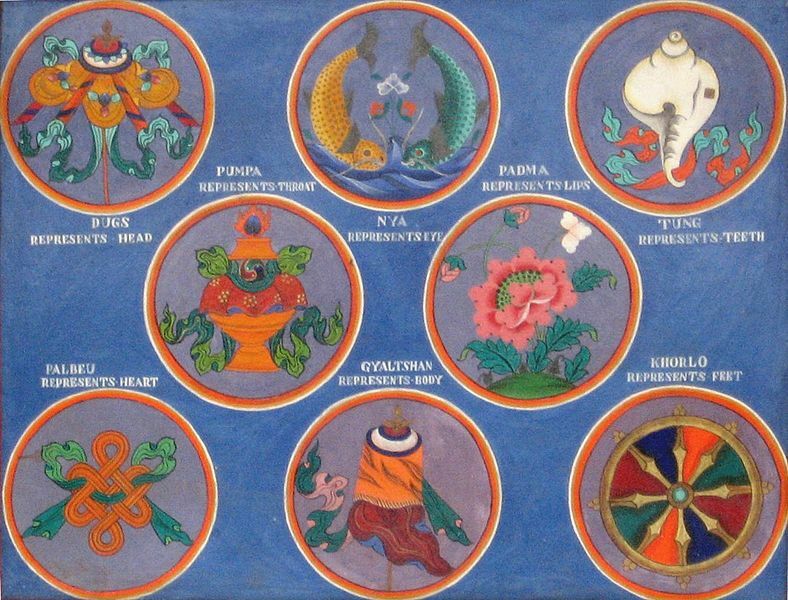 The eight spokes of the wheel symbolize Buddha's eight fold teachings or path. The Parasol: Dug (Skt. Chatra) - The Parasol symbolizes protection from harmful forces, negativities, sufferings and obstacles. The Golden Fishes: Serngya (Skt. Suvarnamatsya) - The Golden Fish represents happiness, fertility, and the unity of two forces. The Treasure Vase: Bhumpa (Skt. Kumbha) - The Treasure Vase symbolizes wealth and prosperity, often contained with elixir of mortality water. The Lotus: Pema (Skt. Padma) - Lotus flower symbolizes purity and is also considered very important because Guru Padma Sambhava, who brought Buddhism to Tibet was born from a Lotus. Conch Shell: Dhung - This ritual instrument is called "calling the prayers". The sound of the conch reminds one of the power of the teachings and work for the benefit of the sentient beings. The Endless Knot: Palbehu (Skt. Shrivatsa) - The endless knot symbolizes lasting friendship and bond. 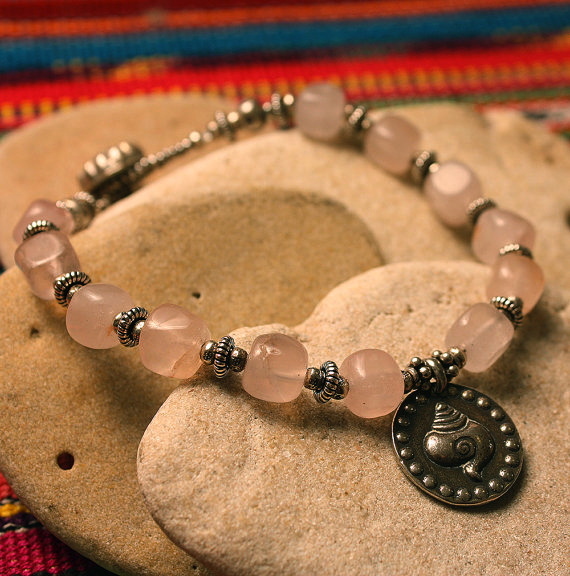 It also represents the Buddha's endless compassion and teachings. The Victory Banner: Gyaltsen (Dhvaja) - The Victory Banner symbolizes victory of truth and compassion over the negative and evil energies and spirits.